Fox Marble quarry operations are built around extensive marble reserves. 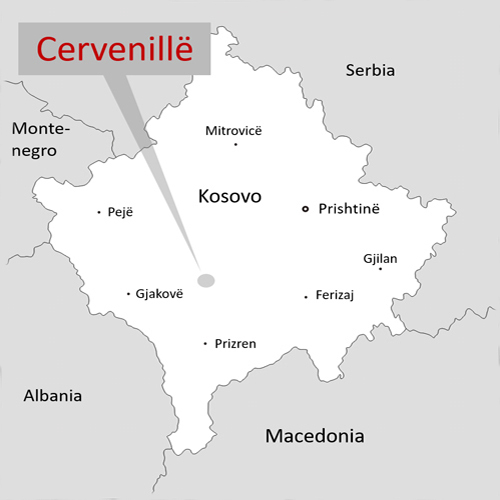 The four quarries in operation are Cervenillë, Syriganë and Malishevë in Kosovo and Prilep in Macedonia. Together these produce nine varieties of stone (excluding the Bianco Glaciale) found in Collections. During 2015 and 2016 the focus was on opening new benches in all of the quarries in order to achieve more consistent and increasingly high quality output. Fox Marble quarry operations are overseen by the company’s strategic quarry partner, Studio Pandolfi in Carrara, Italy. Quarries can be environmentally intrusive. Wherever it operates, Fox Marble is committed to working to preserve the environment and operating in the most sustainable and efficient way possible. Fox Marble works closely with local environment ministries and agencies and ensures that all its staff are trained to implement its environmentally sensitive quarry plans. The Rahovec area in Central Kosovo contains four separate quarries sites over which Fox Marble holds rights: Antennë, Cervenillë, Drin and Verrezat, which together cover over 256 hectares. Opened in November 2012, this was the first of the Fox Marble quarries. 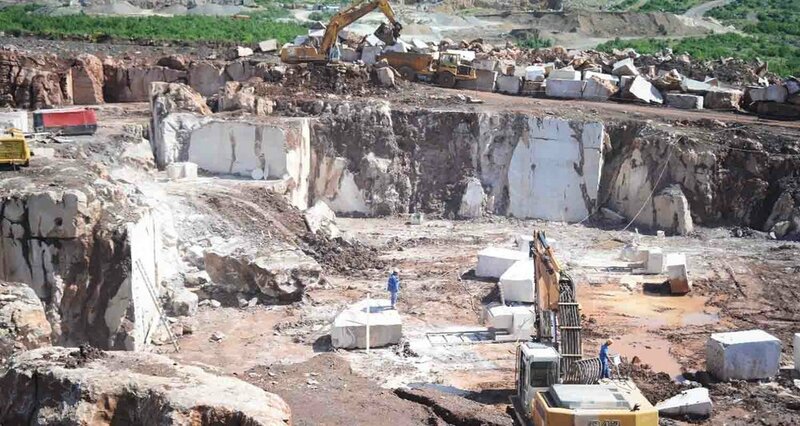 The quarry is being exploited across three separate locations (Cervenillë A, B & C) from which red (Rosso Cait), red tinged grey (Flora) light and darker grey (Grigio Argento) marble has been produced in significant quantities. This is a technically challenging quarry which is traversed by a number of minor faults and fissures shown as broken ground in the photo gallery below. Between those, however, the stone is compact and excellent quality and all the indications are that the next bench will be less challenging. The polished slabs from this quarry have sold well. Amongst the most noteworthy sales, via Pisani PLC, was Grigo Argento to St George PLC (Berkeley Homes) for the prestigious Thames riverside Chelsea Creek development. In July 2013 the Company acquired the rights to the Malishevë quarry in Kosovo from a local company. The Malishevë quarry contains reserves of Illirico Selene and Illirico Bianco. In July 2013 the Company acquired the rights to the Malishevë quarry in Kosovo. The licence to the quarry is for 20 years with an irrevocable option to extend the period by a further 20 years thereafter. In October 2015, the Company acquired the rights to a further 300-hectare site close to the Company’s existing licenced resource in the Malishevë area. By November 2015 the quarry on the new site, known as M3, had been opened and the first blocks extracted and sent to Carrara in Italy for testing. Malishevë M3 proved to contain extensive reserves of the cream white Illirico Bianco and the silver-grey Illirico Selene - both excellent mid-market marble grade limestones. The two occur in alternating bands of varying thickness and, whilst the colour is different, the patterning is very similar, making the two stones, when processed, ideal and complementary twins. By early 2018, just over two full quarrying seasons since the first excavations at Malishevë M3, the quarry is now open over 5 benches and has become the company's most productive extractive opertation - driven by strong and growing market demand. Initially it was the Illirico Bianco and its less marked variant, Illirico Superiore, that attracted most customer interest but, whilst sales of the white have been consistent, the main customer focus shifted very quickly to the Illirico Selene. This is now the major export from Fox Marble's Kosovo quarrying operations. Volume sales in block form, direct from the quarry, to India, China and Turkey are complemented by growing sales of processed Selene from the Fox Marble factory. During 2018 the quarry will be expanded to meet demand. The quarry at Syriganë (Suhogerll) is open across four benches. The site contains a variety of the multi-tonal breccia and Calacatta type marble and produces significant volumes of breccia in large compact blocks. Output is marketed as Breccia Paradisea (predominantly red, grey and white) and Etrusco Dorato (predominantly gold, grey and white). The quarry at Syriganë (Suhogerll) is Fox Marble's most spectacular quarry in terms of location. On a hillside high above the northern Drenica region, a visitor can see more than half of the country from its lip. Open across four benches since 2016, the site has the capacity to produce significant volumes of Breccia Paridisea and Etrusco Dorato. The geology demands particular expertise both fron the Italian quarry master and the company quarry strategist, Prof Orlando Pandolfi. Reserves within the licenced area will ensure that production could meet market demand for many decades. Banjat e Pejës is a 172-hectare site located in Western Kosovo. The quarry site holds 42.1 million m3 indicated reserves and a further 101.2 million m3 inferred reserves of Honey Yellow Onyx. The Quarry is in the planning stages and is not currently being exploited commercially. The Antennë, Drin and Verrezat quarries are not being exploited at present. Verrezat contains 16.8 million m3 of indicated reserves of primarily grey dolomite. Antennë contains 97.2 million m3 of inferred resources of black basalt and grey granite. 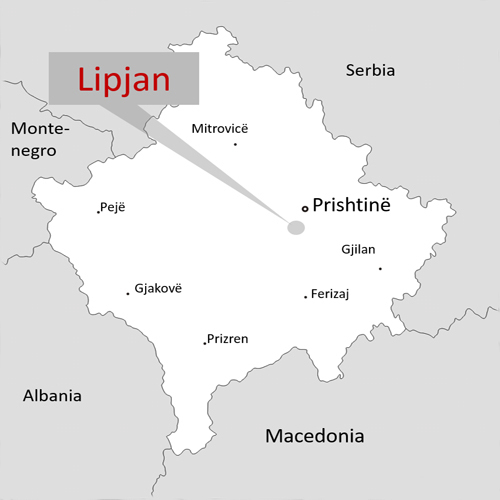 The Company entered into an agreement to operate a quarry in Prilep, Macedonia in 2013. The agreement is for a period of 20 years with an irrevocable option to extend the period for a further 20 years thereafter. The Prilep quarry contains the highly desirable Alexandrian White marble. This type of marble from the Pelagon region of Macedonia has been used in a number of prestigious projects . 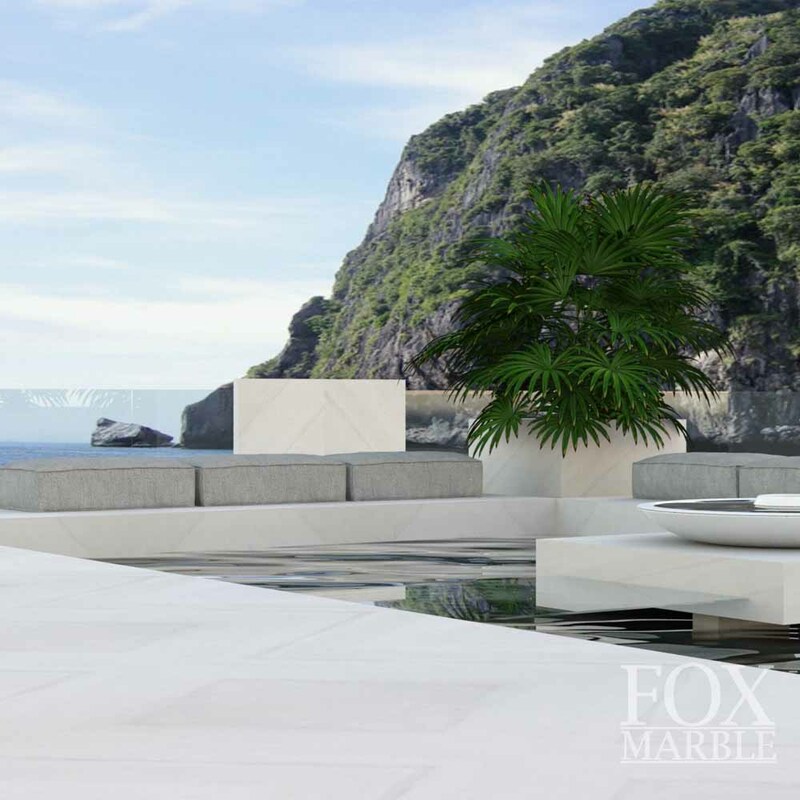 Alexandrian White marble represents the most expensive marble in the Fox Marble portfolio. 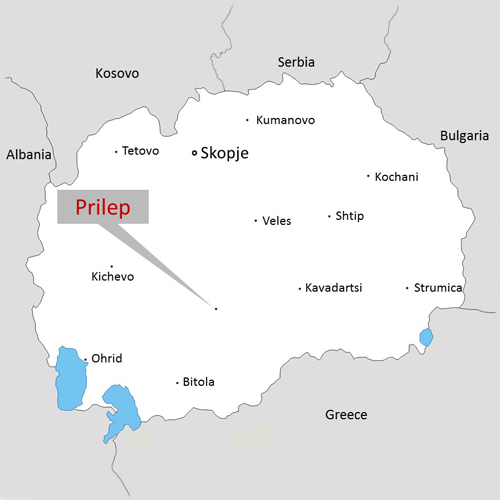 The Company’s first Alexandrian White quarry is known as Prilep Alpha. It is open and producing, and operations are being ramped up to meet growing demand. 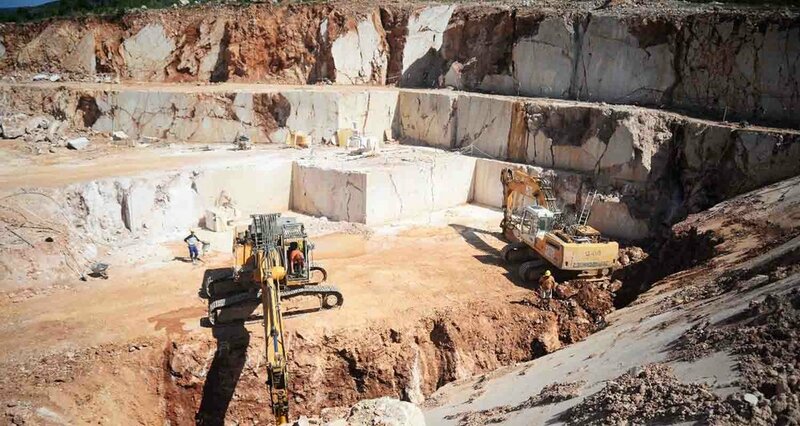 In August 2014 the Company acquired the rights to a second Alexandrian White marble quarry – known in the Company as Prilep Omega. This new quarry site is directly adjacent to the Company’s existing operations in Prilep. Quarry wonderland, January 2019. Snow rarely stops operations in Macedonia for very long. 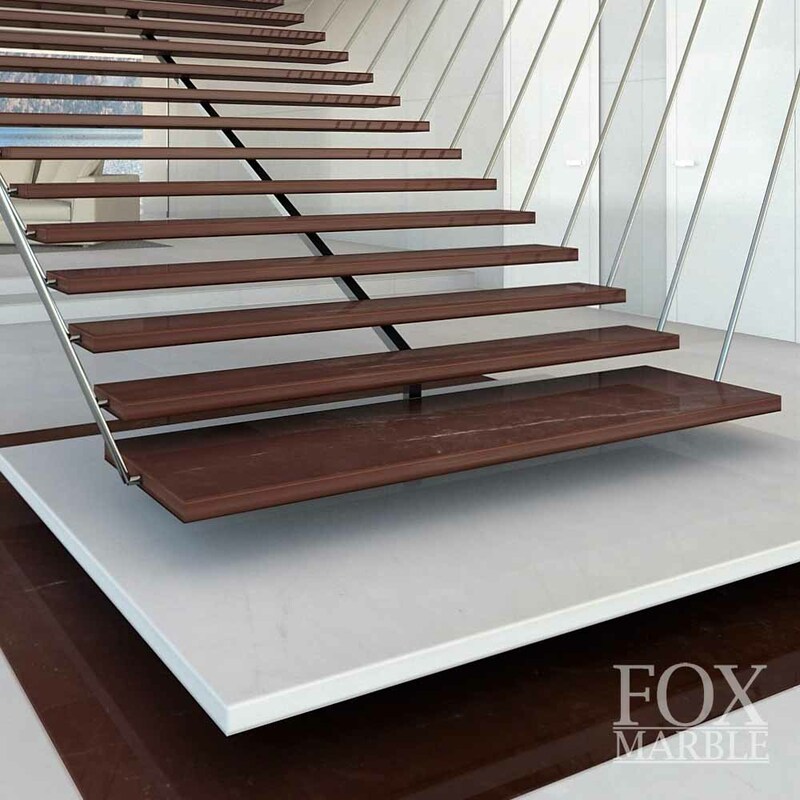 The Fox Marble processing factory is fully operational with production carried out under the supervision of Italian experts. The Fox Marble factory, with the company name emblazoned in 7m high black lettering on the yellow walls, stands prominently on a hillside slightly above the surrounding farmland in the village of Magurë, Lipjan, some 10km SW of the capital of Kosovo, Prishtina and 5km from Pristina International Airport. This location was chosen for its excellent road and rail connectivity to all the company quarry sites in Kosovo and Macedonia, to the wider Balkan region and beyond. The factory is just a few km from the new motorway which connects Kosovo and Albania and enables easy road access to Fox Marble's main export port, Durrës. It is also close to a second international motorway which is currently under contruction. When completed this will open fast road access to the company's second main export port, Thessaloniki in Greece and, once the N-S motorway through Serbia is also completed, the rest of Europe. It is also close to the main north south railway through Kosovo. This is receiving substantial international investment and will eventually give Fox Marble a modern rail freight link, via Skopje in Macedonia, to both Thessaloniki and the rest of Europe. Between the end of 2016 and late summer 2017 the company was able to transfer its entire slab production from Carrara, Italy, to Kosovo as the various stone processing units in the factory were commissioned under the watchful eye of an expert Italian factory manager. Two Italian 80 blade gang saws were the first processing unit to become operational. These cut stone blocks into slabs in thicknesses from 1cm upwards. The slabs then need to be finished. 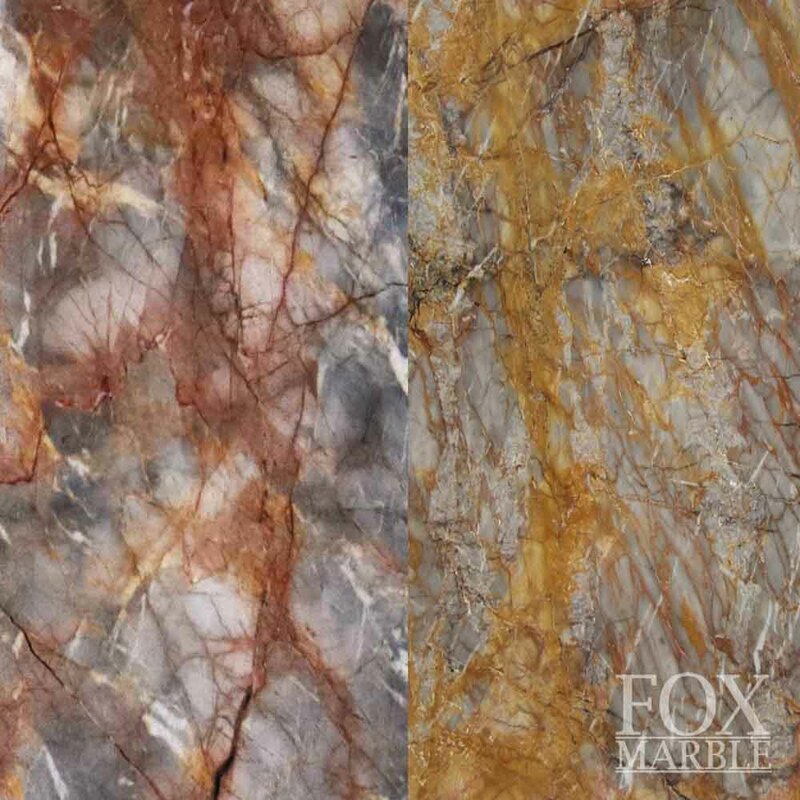 Some of Fox Marble's stone (mainly the Alexandrian, which is brought to Kosovo for processing from the quarry in Macedonia ) can be sent straight from the gang saws to the polishing line but the rest usually requires an intermediate stage - resining. The resin line, again Italian, where epoxy resin is applied to individual slabs to fill any natural imperfections and then cured in giant ovens, became operational during summer 2017. The final stage of slab processing is polishing. 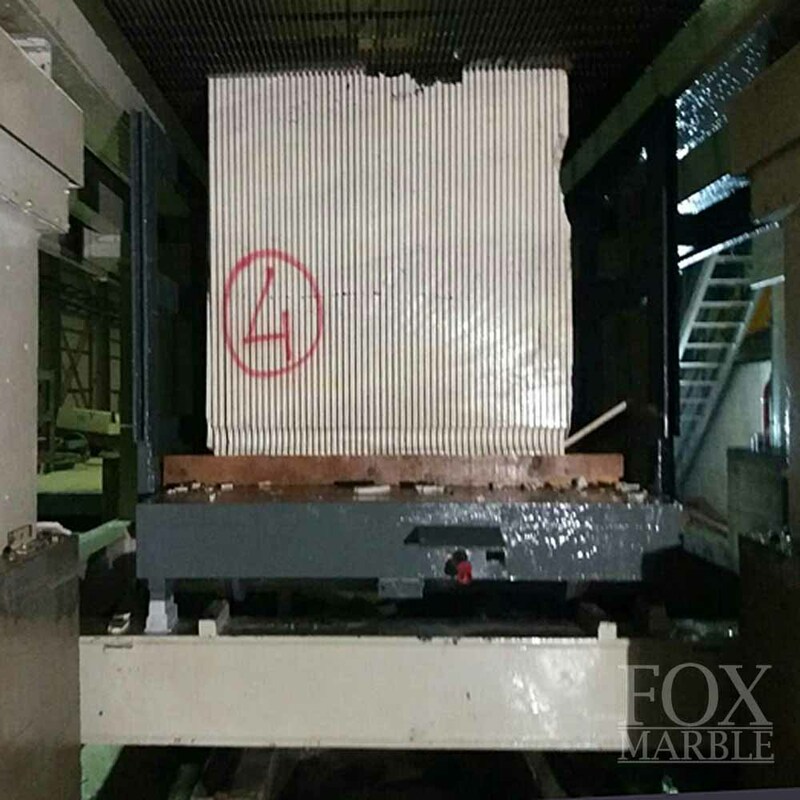 Fox Marble's 19 head Italian polishing line was commissioned in parallel with the resin line. From September 2017 it has been producing polished and honed (smooth but matt) slabs at up to 7m a minute. The gang saws and the polishing line use large amounts of water for lubrication. This is provided in a closed reticulation system topped up from a borehole. The lubrication water picks up stone particles as it is used and so has to be constantly cleaned. This takes place in water filtration plant outside the SW corner of the factory. Built to an Italian design, much of this was fabricated locally. In addition to producing clean water, the plant, with its Italian built filter press, produces a compressed marble sludge. The company is currently examining options for utilising or selling this bi-product. Two further processing units were added in March/April 2018. The first of these was a block resining facility. Some blocks need to be strengthened on the outside before they go to the gang saws in order to ensure an even cut. This is achieved by vacuum sealing resin and fibreglass onto the surface of a block. The block resining facility was designed and built locally. The second was the company's first cut to size processing line. This is a state of the art Italian CNC bridge cutter capable of producing high volumes of stone tiles and larger polygonal shapes. It is the most sophisticated machine of its type in the Balkans (including Greece) and was already producing tiles for export to the UK and Italy in its first week of operation. Increasing demand for cut to size stone has led to the installation of three further bridge saws - two large (non CNC) and one small manual machine for small and simple shape orders. One cut stone edge shaper and polisher has been installed and another will be operational by the end of February 2019, the same time as the company’s dedicated tile polishing line. 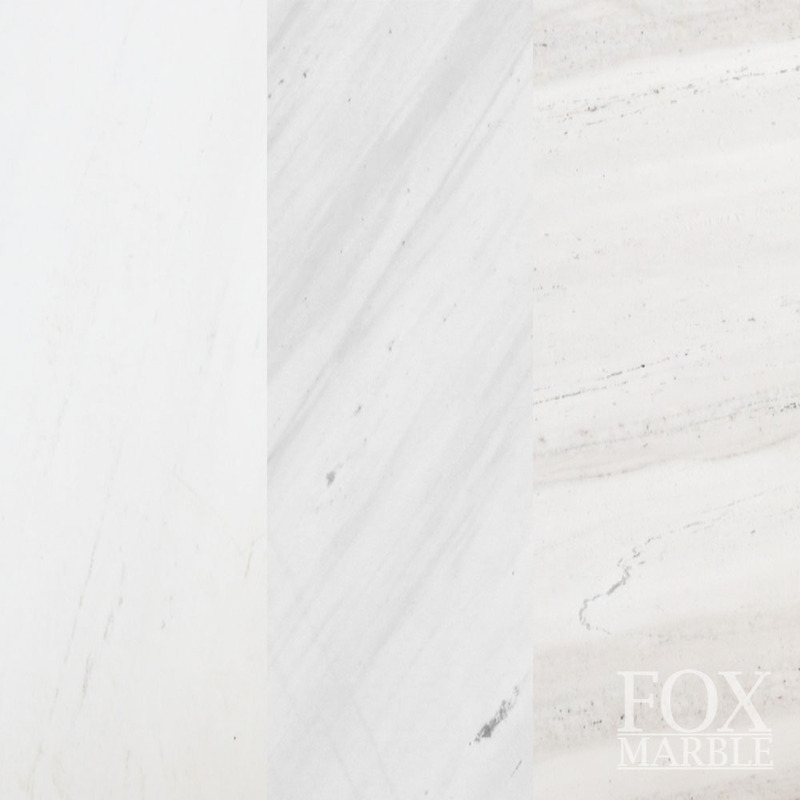 With its growing cut to size capacity, Fox is able to satisfy three distinct marble market segments - block, slab and, of course, cut to size. The block market is primarily in countries which have their own stone processing industries such as India, China and Turkey. Finished slab is the preferred product for Fox Marble's US customers whilst the local and wider European market more usually demands cut to size. During the course of 2018 and into 2019 the company has welcomed a number of VIP visitors to the factory. The first was Martin Vickers MP, the Joint Chairman of the British All party Parliamentary Group for Kosovo who visited in February. British Ambassador Ruairi O’Connell visited in April while Kosovo Prime Minister, Ramush Haradinaj, together with the local press corps, visited in January 2019. The PM’s visit got widerspread media coverage in print, online and on TV raising local awareness of the company and its operations. The PM heralded the company’s contribution to local employment and to Kosovo exports. 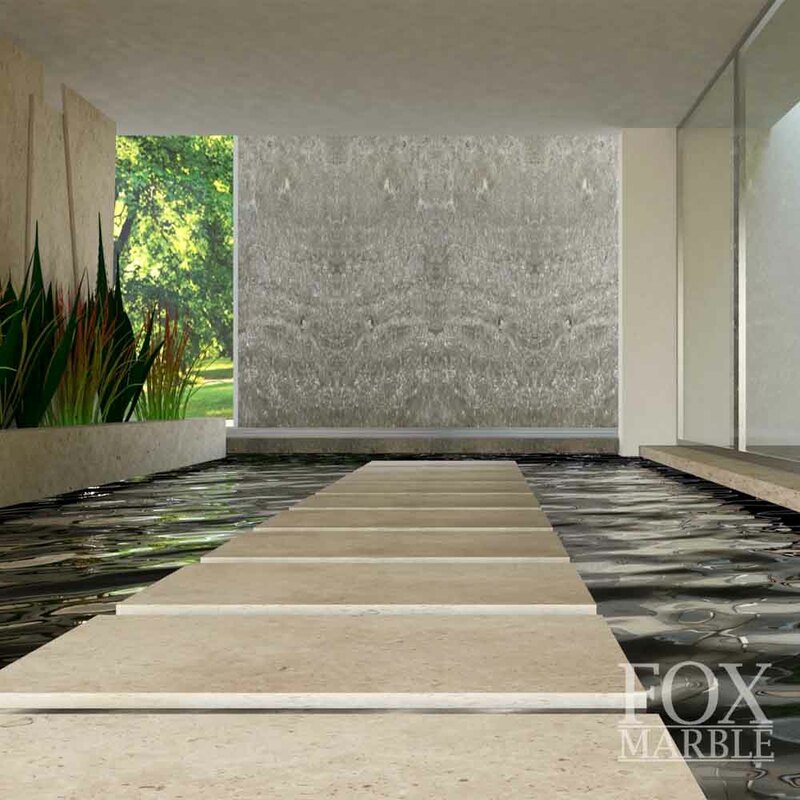 Whether it is block from the quarries or processed stone from the factory, Fox Marble is proud to be realising its strategic corporate vision of delivering its exclusive high quality marble and marble-grade limestone to the world market at the most competitive prices possible. The factory from the NE. Main access road to the right. Turkish made gantry crane to the left over the block yard. This is the first building on what is to become the Magura Industrial Park. It sits at the centre of a 10ha site owned by Fox Marble. Blocks from Cervenille being delivered to the factory. June 2017. A newly vacuum-resined block of Etrusco Dorato about to be moved for cutting on a gang saw. April 2018. Breccia Paradisea block viewed from above during cutting. Blocks are lifted at a rate of up to 20cm per hour through the gangsaw blades. To ensure an even and consistent cut the factory manager places wedges between the partially cut slabs and between the trolley sides and the edge of the block as it is lifted. Clarified water is sprinkled on the block to lubricate the blades whilst cutting. February 2018. Two small Alexandrian blocks in one of the gang saws right at the beginning of the cut. The blades move in the horizontal plane and the stone is lifted through them very slowly. September 2017. The two Barsanti gang saws being prepared for first operation. Turkish Wimac semi-gantry crane above. November 2016. The gang saw on the right is cutting. That on the left is being prepared to cut. Slabs in the foreground are a mix of stones though predominently Alexandrian from the Fox Prilep Alpha quarry in Macedonia. February 2018. Slabs of mostly Alexandrian White awaiting polishing. February 2018. Gaspari Menotti polishing machine in operation June 18. Ilirico Bianco slab on the Gaspari Menotti polishing machine. February 2018. Looking north down the polishing line from the end of the line to the Gaspari Menotti polishing machine. Polished Alexandrian slabs on A frames awaiting removal to storage elesewhere in the factory. April 2018. The first GMM CNC bridge cutter in operation. This machine, the most sophisticated of its type in SE Europe, represents a production and technical step change for the company. April 2018. The GMM CNC Bridge Cutter making very short work of slicing through four 2cm slabs of Alexandrian White while making 20x20x2 tiles. April 2018. Alexandrian 20x20x2 cm tiles freshly cut for an Italian customer still on the GMM CNC bridge cutter. April 2018. Part of the first shipment of 90x30x2 cm Illirico Bianco tiles awaiting shipment to London. April 2018.